All girls and boys who are playing on our teams and also compete in different tournaments train together in the team practice. This practice always takes place with two qualified coaches. For years our first youth teams of different age groups have been playing in the highest Berlin leagues. In these groups we are always looking forward to welcoming new faces with the necessary experience. Once the basics have been learned in the “bambini” or beginners’ groups, the youth players can switch into the team practice groups. These are also run by two experienced coaches. It’s important for us that the children practice regularly and enthusiastically. Those who practice hard and show a good performance are especially promoted through additional individual practice, better training partners or one-to-one training. The focus of team practice is on learning the table tennis techniques and tactics. We also train coordination, mobility and fitness. This way the youth players are getting a good sportive education. In the past years our kids have repeatedly shown good performances at the Berlin-wide (Berlin Table Tennis Association, BeTTV) and also supra-regional tournaments, which also resulted in podium placements. Many of the youth players later on switch into adult groups and competitions and some become coaches themselves. At the end of school holidays, our club usually offers training courses over several days. Girls and boys between 8 and 18 as well as adults train twice a day to prepare for upcoming competitions. We very much recommend participating in these courses because the kids not only improve their table tennis skills but also grow together as a team. We have two big internal tournaments at our club. 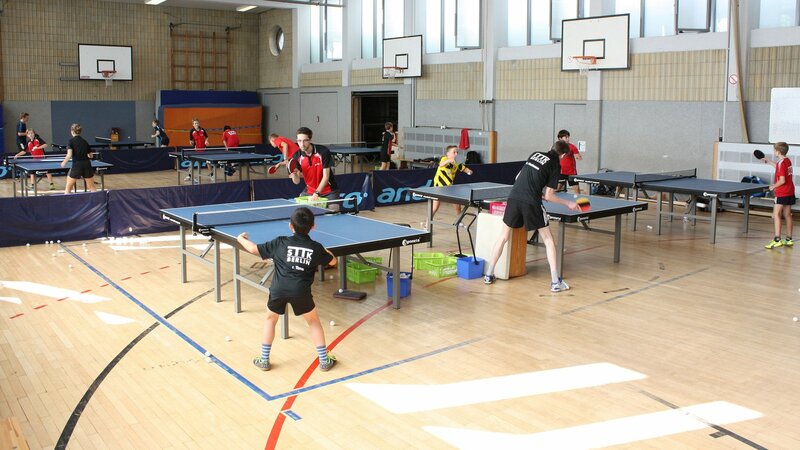 The first one is the ranking tournament in winter, in which the club’s top eight players of each age group compete. At the end of each season, just before the summer holidays, we play our club championship. Everyone can take part and try to make it into the final. Just before Christmas we also play our Christmas doubles tournament. This is mainly about having a good time with food and nice company. We are always happy to see new faces in the team practice groups. If you are interested or have any questions, don’t hesitate to contact Christian.